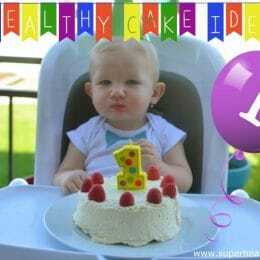 Healthy option for Baby’ 1st Birthday Cake! Celebrating your child’s first birthday doesn’t have to mean letting them dive into a cake filled with sugar and processed oils! You can make a deliciously healthy cake for the baby- that will equally be tasty for your guests. Our culture is to be social. As humans, we create traditions around food that help to shape who we are. Having a sense of community and joy has actually been shown to be more protective against disease than diet or exercise. And there is no need to stress about your baby over doing it by giving him his own cake. Most babies just play with it, more than they eat it. 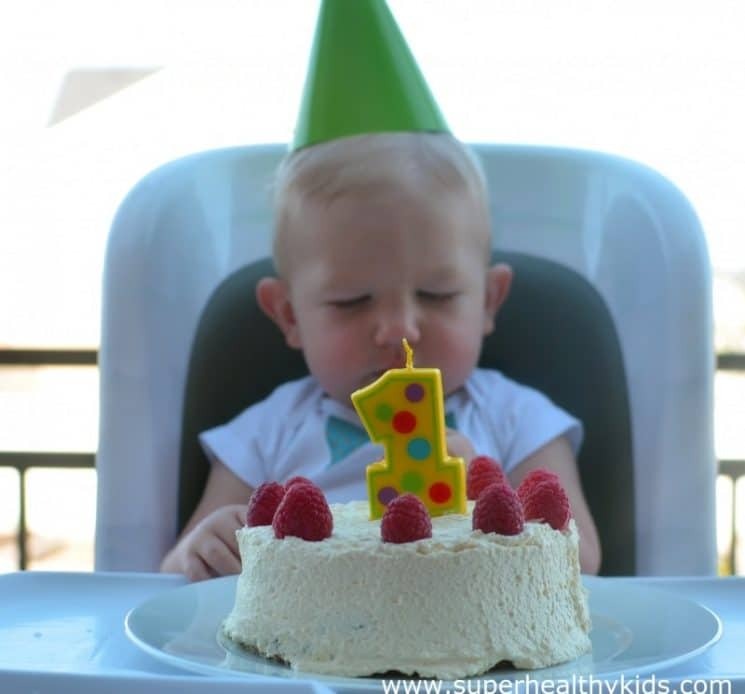 We added some raspberries to the cake for this cutie in the photo, and guess what he did? He pulled off the raspberries and left the rest of the cake alone 🙂 Kids are awesome. What I’m trying to say here, is you can have both! You can keep fun traditions- such as your babies first birthday cake, while not exposing him/her to foods you aren’t ready for him to taste yet. My daughter’s first birthday is only a month away and I need some help figuring out a recipe for a healthy birthday cupcake. I knew I wanted to make a cake without sugar or oils, so this is what we came up with. First- we mixed a banana with peaches in a food processor till it was smooth. Not only did this sweeten the cake naturally, but it also helped bind it altogether. Then, using the fruit puree, I mixed up our cake mix. (full recipe below). For the baby, we poured it into a 6 inch round cake pan. For the frosting, I wanted to keep it simple, organic, and natural. So, we used pure cream. For the babies cake, we just used cream. 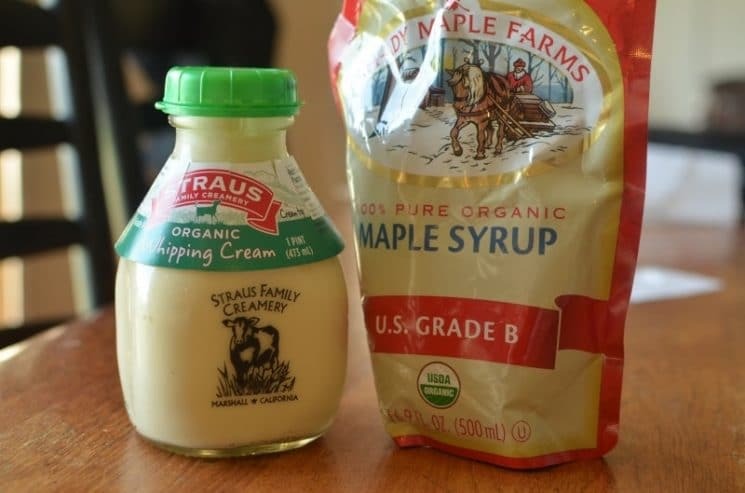 For the guests, I added 1 tablespoon of pure maple syrup. To make whipped cream, pour your cream into a heavy stand mixer. Using a whisk attachment, whisk the cream until it’s somewhat stiff and fluffy. Then frost your cake. And of course, don’t forget to top the cake with fruit! YUM!! I can’t tell you how delicious these turned out! Really, it’s like a muffin– except we didn’t add sugar or oil. I couldn’t have been more happy with the results.. and the kids? Well, they are all gone! For More healthy cake ideas!! Blend fruit together in a food processor until liquefied. This gave us 1/2 cup of fruit puree. Whisk your fruit puree, milk, egg, and vanilla together. In a separate bowl, combine whole wheat flour, baking powder, soda, and salt. Slowly pour your liquid ingredients into the dry, and mix until the dry ingredients are all wet. Pour your batter into a greased 6 inch round pan (Double ingredients to make a double layer). Bake at 350 for 20-30 minutes, or until you can stick a knife through the center and it comes out clean. Frost your cake or cupcakes and top with fruit. Thank you so much for featuring our Pirate Cake! I love how your cupcakes turned out. So cute! 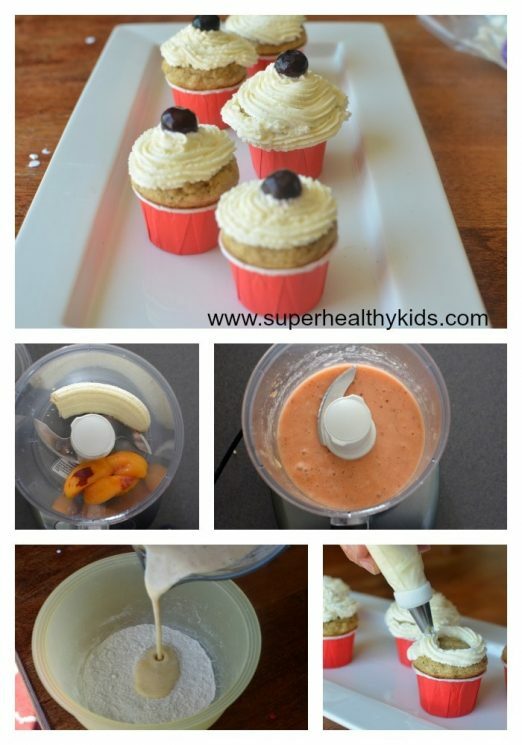 Great idea minus the milk yuck can almond or coconut milk be used? I would suggest Organic Products and Spelt flour with almond flour instead of wheat. Too many people have developed gluten sensitivities (which also includes soy, corn as well). Or, how about brown rice or kamut flour? Have you tried using these? Well he is also allergic to almonds and all kinds of nuts also. @Erica- I agree with lupe- any fruits will work. Just get 1/2 cup of fruit puree, and the recipe shouldn’t change much at all. I think it could Cas! Let us know. Hi can you use tinned peaches in fruit juice drained? what can be used instead of a dairy based milk for the cake and cream for the icing? I have a daughter allergic to dairy based products. can other fruits besides peaches be used with the banana? WHat can be used to replace the whipping cream? Do you think it would be good if I used cocoanut flour? Would it still be 1cup then? You can try this with coconut milk? http://ohsheglows.com/2012/08/30/coconut-whipped-cream-a-step-by-step-photo-tutorial/ to sweeten it use agava or even maple syrup or just plain old powered sugar if you don’t mind using it. Hope this helps! Cans are lined with metals and plastics. I wouldn’t suggest using canned foods. We want to eliminate toxins in our environment not add more. She may know that. Lol. But it is possible to use tinned peaches . @christian- check out Lisa’s link below! It’s a way to make it with coconut milk! Any fruit could be used. Just get 1/2 cup of fruit puree. I haven’t baked with coconut flour Deb. Have you used it as a substitute before? How did it turn out for you? I used frozen peaches, that have been defrosted if you don’t want to use canned. Looking for snacks for my 1 year old. My son turns one in 1 month and I have been having a hard time deciding what to do for his cake – but I think this made my decision for me! Thank you so much for sharing! Is the cooking time and temperature the same for regular size cupcakes? 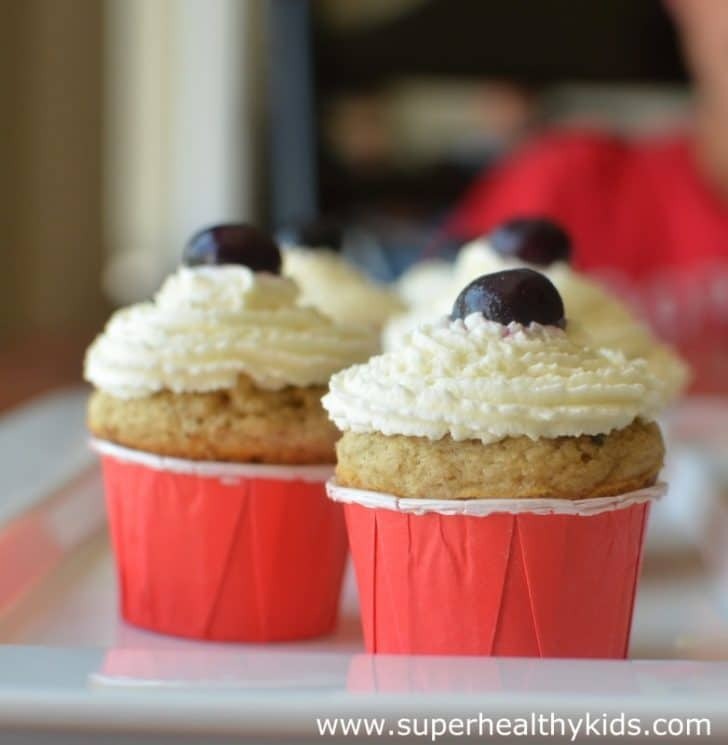 Thank you…I can’t wait to try this recipe for my little one’s birthday! Sorry Lisa- the cooking time is for the small cake itself. Muffins I would only cook for 15 minutes. Thanks for noticing, I’ll edit that to be more clear. Fantastic recipe! Will be trying tomorrow, fingers crossed my baking skills are up to it! When you say “vanilla” in what way do you mean it? Do you take a vanilla pod and remove the seeds? Is there another format I don’t know about? Sorry, but I’m no expert at baking or cooking! 🙂 Thanks a million! Hi @Sara- I just mean vanilla extract. I actually haven’t tried using a vanilla bean, but I need to soon! could you tell me how dense the cake was? bookmark your webllg and check agaiin here regularly. I’m quite sure I will learn plenty of new stuff right here! Best off luck forr the next! What kind of milk did you use? Whole, skim, etc.? Does it matter? @Kristina- I used 2% but it doesn’t really matter for this cake. Can I use regular unbleached flour instead of wheat flour? I’m wondering if the cooking time and ingredient ratios will all stay the same. Trying this in Feb for baby 6…..I always felt I was making a healthier choice making carrot cake (still has too much sugar) for their first cake but this looks AWESOME, thanks for sharing this recipe! Love your website! Thanks for all the lovely recipes 🙂 Can I use pineapple instead of peaches? Hi,Can we replace the egg.As I’m vegetarian. Hello. This looks very yummy and looking forward to giving it a go. …but I have a question for you. You mention that cakes have processed oils in them and it has stumped me to work out what oil people are putting in cakes. My basic vanilla cake recipe has flour, baking powder, butter, sugar, eggs, vanilla and milk. I am not trying to suggest My recipe is sugar free or anything just curious about the oil comment. I’m wondering if you could use baby food since its already pureed. I’m so over stocked from WIC! Yes Vijaya. You can replace the eggs with a standard flax and water mixture. Usually when you cook with a cake mix, you add oil and eggs. Thank you for clearing that up. I was thinking I had been making cakes wrong all these year. I don’t use packet mixes due to cost and who knows what goes in to them! Must admit I am a bit biased to give up sugar though – 3rd generation sugar cane farmer here!! But I have tried your cake and it was delicious. I have a choc brownie recipe that uses apple puree that my children love so I will give it up occasionally. Can you use just egg yolks? My baby hasn’t tried egg whites yet. Or maybe something you can use instead of eggs? I’m not sure how well the yolk alone would work Shannon- perhaps an egg substitute would be better if you don’t want to use the whole egg. 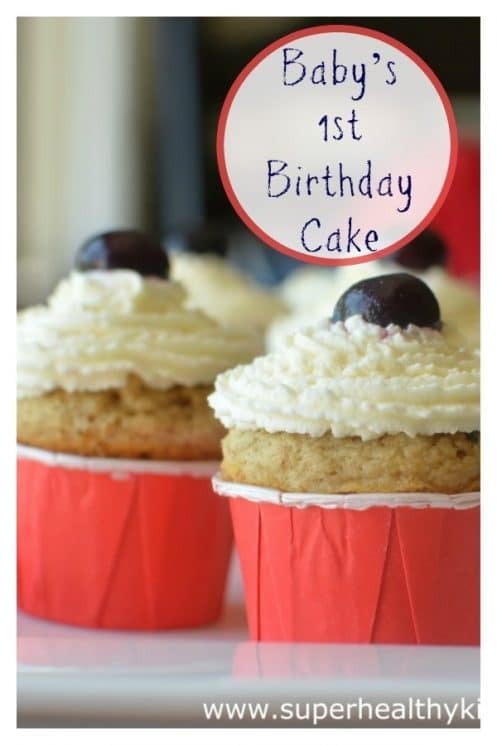 I had looked around for a while for a recipe for my son’s first Birthday and when I came across yours knew it was perfect. Lachie loved it so did we and his Grandparents! It was such a success that I am making it for my husbands Birthday so Lachie can join us for cake too! I’m not a big fan of bananas. Can you taste them in the cake? Is it possible to swap out the banana for something else? It does have a bit of a banana bread flavor. You can try to swap out other fruits instead. Hi Amy! I need help asap. Next week i want to bake this cake again but for a bigger crowd and i’ll assemble a bunny. I need two 7 inch pans and one 8 inch. How can i get this amount of batter? Thanks! PLEASE be quick replying! You would want to triple the recipe for that much cake! Good luck!! Thaaaank you!!! Will try and let you know ?? Think it work without the baking powder? I try to avoid it because of the aluminum. Probably not Mary, since it’s needed for rising. But you can just buy aluminum free baking powder, couldn’t you? that’s what we get. Wow, I know I’ve come across some recipes that have great reviews but they just do not turn out. This was not the case! WOW so good, I absolutely loved it! It is perfect . My only regret is not doing this for my daughters 1st birthday, but now she’s gonna have a great 2nd birthday cake 😉 thanks for the great recipe!!! I have no idea how that works!? If you’ve done it in other baked goods, than I would say yes! Has anyone tried an alternate flour with this (baby and I are celiac-ies)? Curious if coconut flour works or if I should just use GF flour? I’m guessing almond will be too moist and just fall apart…Thanks in advance! Is the cake that’s pictured a single or double recipe? Hi Paula, I’ve honestly never used spelt flour, I”m not sure how it reacts, or if it’s a good substitute or not. Kim- it was heavy whipping cream. We whisked it until it was stiff! Can the birthday cake be prepared in advance and frozen? How far in advance can it be prepared? Amanda- I’m not too efficient in the freezing baked cakes category, but I definitely wouldn’t freeze the frosting! I’d only prepare this one day in advance and no longer. I’ve tried this recipe twice for in preparation for my son’s first birthday but the inside of the muffins always seem like it’s uncooked even though it’s been in the oven for 30 mins. I put it casing like the ones in your picture and put it in the oven at 180 degree Celsius for 30 min and it’s still doughy inside. Margaret- are you at high altitude perhaps? Maybe adding a bit more flour would help. I would start with 1/4 cup extra flour. This would be perfect for any age birthday. Think I’m going to make this for my daughter’s 7th birthday next month. But strawberries instead of peaches. How many strawberries or size of frozen strawberries package should I use? And could I use all purpose flour as that is all I have. Ashley- you want to go for 1/2 cup of fruit, once it’s all blended together. How did the cake turn out with the strawberries? I’m thinking of doing that too. Thanks!! My sons first birthday is coming up,so this will be perfect. My question is : did you used the same mixture for the cake and muffins ? Yes Daniela- the exact same! Hi, I’m going to try this for my daughger’s first birthday, sounds great! Just wondering if I could use a cream cheese frosting instead of whipped cream? Thanks! Hi! New mom here and a novice baker. Do glad I found your recipe, can’t wait to try it for my son’s first Bday. Question: is there a way to naturally “color” the frosting? Yes @jacqueline. We’ve used a little beet juice to color it pink, or blueberry juice for blue! Oh no! Did you make sure you only had 1/2 cup of liquified fruit? And was it blended until it was drippy? Also, did you use whole wheat flour? Hey! Cant wait to give this a go for my sons first birthday! Question : could i use coconut oil in place of butter milk? How much shoukd i use? Thanks! I’ve never made that substitute Megan. I don’t think they do the same thing. Made this for my son’s first birthday and it was a HUGE hit. Thanks! Made it in 4 little person sized cakes and he loved the cake better than the cream and his favourite mandarin oranges that were on it! I’m going to make it again in a mini muffin tin for yummy snack times. ? Hi! Thanks for the recipe. I tried baking this but the muffins turned out to be quite dense ?. I did not overmix..and the banana flavour was predominant. Thanks for the recipe! May I ask what would happen if we left out the salt? I don’t think you can leave it out Daniel, but I haven’t tried i t.
Many thanks for replying Amy, and many thanks indeed for the recipe! I tried it and it was the first cake I’ve ever baked. I didn’t add the salt and it was a success, to my wife and I at least, coming out like a cake-like and light banana bread. Now just the real test at my son’s first birthday party to come! Hi Amy! My cake turned out like one of the previous comments said: with a crust outside and raw-like on the inside 🙁 I used a puree of banana, persimmon and mango. I used the brown flour and followed all the recipe. I want to make it a second time. Did you use an electric beater or just hand whisking and mixing? Any suggestions? Thanks! A great cake, rose beautifully, thanks for the recipe! Ok, tried it again with an apple-banana puree (with a touch of cinnamon) and it’s freeking delicious ? Still didn’t rise much much it baked beautifully, light and fluffy inside, just the right crunch on the outside. A bit like a sweet bread. Soooo yummy! Nothing like NOT giving up. I’ll sandwich it and frost it with the same fruit puree because it’s for a bunch of small kids 🙂 Thanks all! Haha!! Patricia!! Sorry for my super delayed reply!! I’m so glad you tried again. So many recipes don’t work out the first time, in my experience (especially breads!) Thanks for being a reader!! Can this cake be made without adding salt? Did you know that this post is being displayed with FIVE ads for McDonalds? I know you wouldn’t choose this, but you need to proactively talk to your ad buyer to tell them you only want ads that fit with your ethos otherwise you’re damaging your credibility. Thanks for the report Noni! We aren’t always seeing the same ads, so it’s hard to know what everyone else is getting. We’ll see what we can do! We are not in the peaches season. What could I use to replace it? For icing: can of coconut CREAM, pu in frig for an hour. Put mixing bowl and beaters in freezer. When solid, put just the solid coconut cream in bowl, don’t use any of the liquid in the can, and whip until stiff. Turned out perfect and delicious all babies with and without food allergies lovedddd! Hi Sarah, sorry to hear it didn’t turn out for you! I’m not sure how vigorously you mixed the wet and dry ingredients, but it helps not to OVER mix the two. Over-mixing can make baked goods like this one turn out a bit flat. Can I replace the banana with other fruits? Hi Gallie! We haven’t tried using other fruits besides banana; the cake might turn out a bit less sweet. But if you try it, please let us know how it turns out! I love this. I want to get my family eating better. This is so inspiring! Thank you. How deep is the cake pan? Hi Jane, a 2-3 inch cake pan is plenty deep for this cake. Would the cake work the same if you replaced the peaches with pears instead? Hi Erica! We haven’t tried it with pears, but it sounds delicious. If you try it, please let us know how it turns out! So good used baby food pouch apple and summer peach Gerber organics brand since I couldn’t find peaches at the store. So good. I got store bought cake for the adults but everyone ate the cupcakes instead made 24. So good gonna make cake like this all the time. I used unbleached flour instead of whole wheat as well. Wish I could leave a picture not sure how to do this. I made this cake and it was awful. Having to make another cake now using a better recipe. It puffed up full of air and had a thick shiny skin on the outside. No flavour apart from whole-wheat flour. Thanks for wasting my time. This is a really delicious cake! I baked it for my daughter’s first birthday last year and I’m going to bake it again this year! I prepared everything three times and then baked it like I did last year to have enough for the party guests. Everyone loved it! 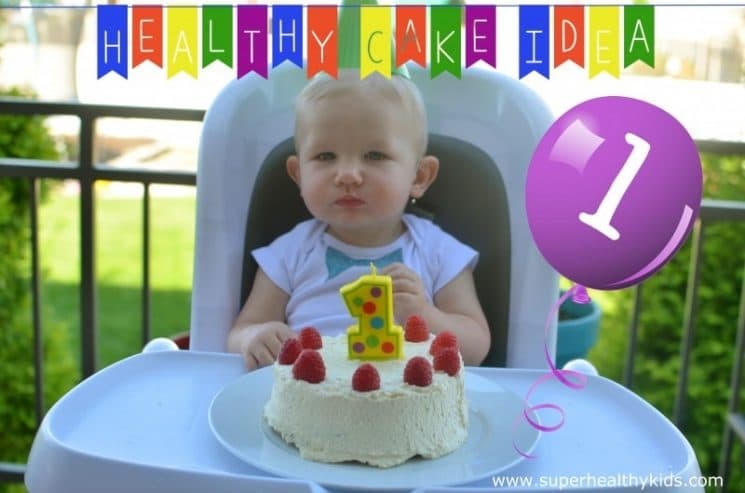 I loved knowing that I was feeding my daughter something healthier than a cake full of sugar. The only thing I did differently was I used coconut cool whip to frost. I haven’t been able to make the coconut milk work as a frosting for me. But, I will try the coconut frosting again! Thank you for the recipe! I made this last weekend as a trial for my son’s first birthday without the topping. I used frozen peaches because peaches are not in season now and a very ripe banana. It took twenty five minutes longer to bake than advised – not sure why but that’s when the toothpick came out clean. To me, it doesn’t taste like cake but more like a healthy breakfast bread. I’m sure with the whipped maple cream topping it would be sweeter. That said, my son loved it and I’m glad it is not bad or too sweet for him. It’s also not bad for us so my husband and I didn’t feel bad about eating the leftovers either. I’ll be making it again for his party but getting traditional cake for the adults. What’s the full recipe it’s only showing the banana and peaches! Hi Emma, sorry for the mixup! We made some big updates to the site last week and a few of the recipes got a little glitchy on us. The full recipe should be back now. Thanks for your patience!